One of the earliest surviving texts attributed to a woman writer, the Itinerarium Egeriae (The Travels of Egeria) preserves the account of a female traveler in the Holy land. Although not much is known about the traveler herself, a woman named Egeria, most scholars seem to agree that she started her pilgrimage in northwest Spain, likely Galicia--though there is some disagreement here, with others suggesting she was from southern France. The date of her travels is also uncertain. Egeria probably made her journey between the years 381 and 384, and since she arrived in Jerusalem in time to celebrate Easter, I have chosen to post about her today. Her extant writing takes the form of an extended letter addressed to her sorores--"sisters"--a word that has led some readers to conclude that Egeria was a nun, but there is now a general sense that Egeria was probably a wealthy lay woman addressing herself to a group of women who shared her faith. 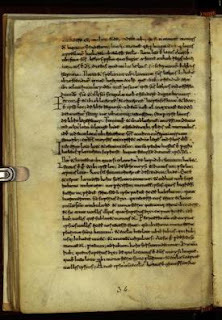 The part of Egeria's text that survives is found in a manuscript copied between the ninth and twelfth centuries, now known as the Codex Aretinus. This fragmentary account of Egeria's Itinerarium was rediscovered and identified at the end of the nineteenth century. Two new fragments were identified in 2007, these dating to a copy made about the year 900. But there are references to Egeria's work made in the centuries after she traveled, showing something of the transmission of her text among Christian readers. Egeria is praised by Valerio of Bierzo, a seventh-century monk from Galicia. A glossary from the eighth or ninth century quotes from her Itinerarium. And the twelfth-century Benedictine monk Peter the Deacon, librarian of the abbey of Montecassino, also refers to Egeria--Montecassino is where the the Codex Aretinus was copied. What survives of Egeria's letter is in two parts. The text begins mid-sentence, with Egeria already in Jerusalem (the journey from her home to the Holy Land is missing). In this first part of her "travels,' she writes about her extended stay in Jerusalem, from which she takes a number of shorter journeys. 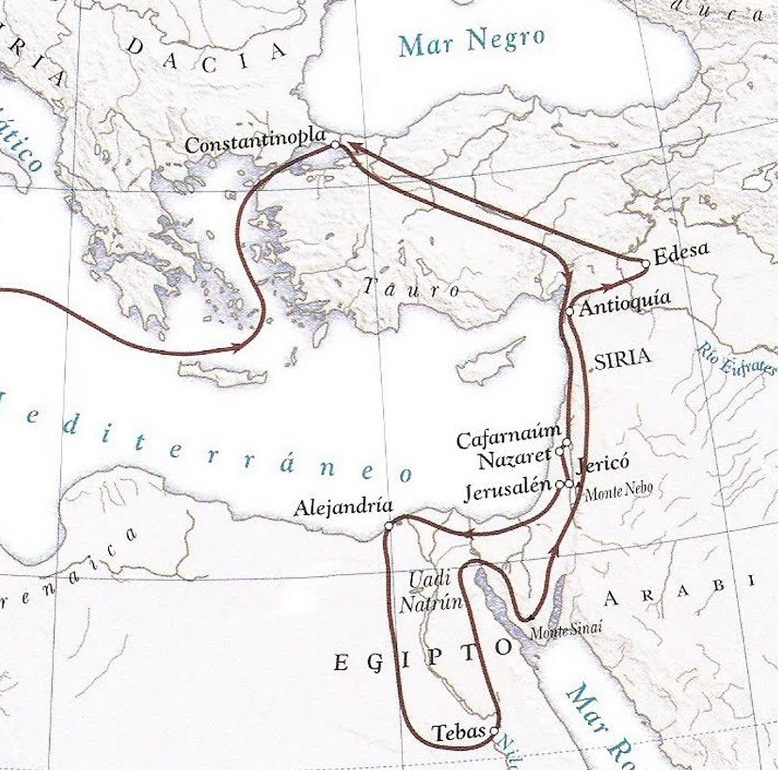 From Jerusalem, Egeria travels to Mount Sinai and on to Mount Horeb, then to a garden where she sees the burning bush mentioned by Moses; to the "city of Arabia," which is "in the land of Goshen"; to the Jordan Valley; to sites in Mesopotamia, after crossing the Euphrates; to Edessa, Antioch, the shrine of St. Thecla, "a three-day journey from Tarsus," and then to Constantinople. 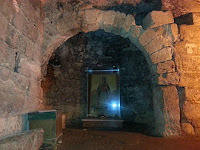 As she travels, she writes about those who serve as guides and interpreters, especially monks, and she relates each place she visits to biblical accounts of the sites. Between 2000-2006, The Egeria Project was established online. The site is still accessible, but it seems not to have fulfilled its goals. Like Egeria's original text, it is incomplete. 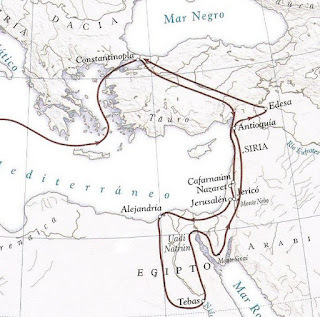 Scholars have repeatedly attempted to map Egeria's various travels--the difficulties in doing so are outlined by Cristina Corsi, in her "Topographical issues in the Itinerarium Egeriae: An Essay on the Modalities of Travel in the Fourth Century AD." The essay contains a great deal of fascinating information. For the text of the surviving Egeria fragments, The Pilgrimage of Egeria is available here.